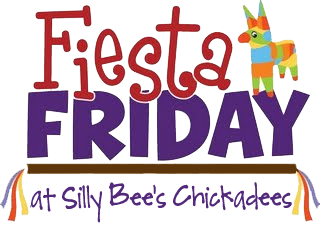 Welcome to the first installment of Fiesta Fridays. Today is all about invitations! If you know me, you know that making invitations is one of my favorite things to do. I could go on and on about them and have dozens of ideas, but we’ll just start with the first handmade invitation that I ever made. It was for a Christmas party and that probably doesn’t help you all that much this month, but maybe you can bookmark this post and come back to it in November! So. Invitations. Basically they bring all the boys (and girls) to the yard. You may get some gracious guests to your party, after all, you are fabulous! But if your invitation is boring, chance are you won’t get any blown-away, uber-impressed, I’ll-just-die-if-I-can’t-go-to-this-party revelers (not a real word, I know). Formal printed invitations are lovely, fill-in invitations are quick and email invites can be cute and practical, but I think a fun handmade invitation really sets the scene for fabulosity. Sometimes, I follow a mailed invitation with a fun email a week before the event. That way, people can access the party location with their internet devices if they’ve forgotten their invitations on the way over. At any rate, handmade invitations rock, in my party book. You don’t have to be an artist or designer. Just do a bit of brainstorming to come up with your theme and some fun ways to give your guests a taste of what’s to come. If you’re throwing a birthday party, call it a “Birthday Blow-out” instead and put some balloons in the invitation. If you’re throwing a Valentine dinner, call it “Hearts Afire” and tuck a tiny folded invitation inside a matchbox. You get the idea. Back to the caroling party. 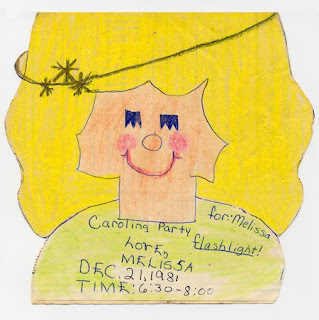 You are free to copy my super fab caroling invitation circa 1981, or you can try one of the following that I came up with just for you. 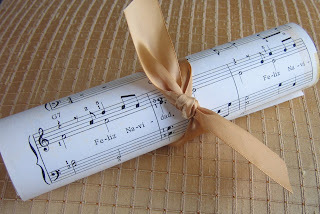 If you are going to pass out the invitations at your child’s school, print the info out on a sheet of paper and mount it on a sheet of Christmas music, roll it up, then tie it with a pretty ribbon. You can find an inexpensive Christmas music book and tear sheets out of it. My sheet music is from my piano days when I was little. The second photo shows a cute invitation that you can easily make and pass out to friends. 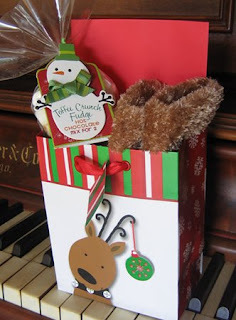 Just buy some hot cocoa mix and some inexpensive mittens and stuff them into a cute Christmas bag with the party invitation. Voila! 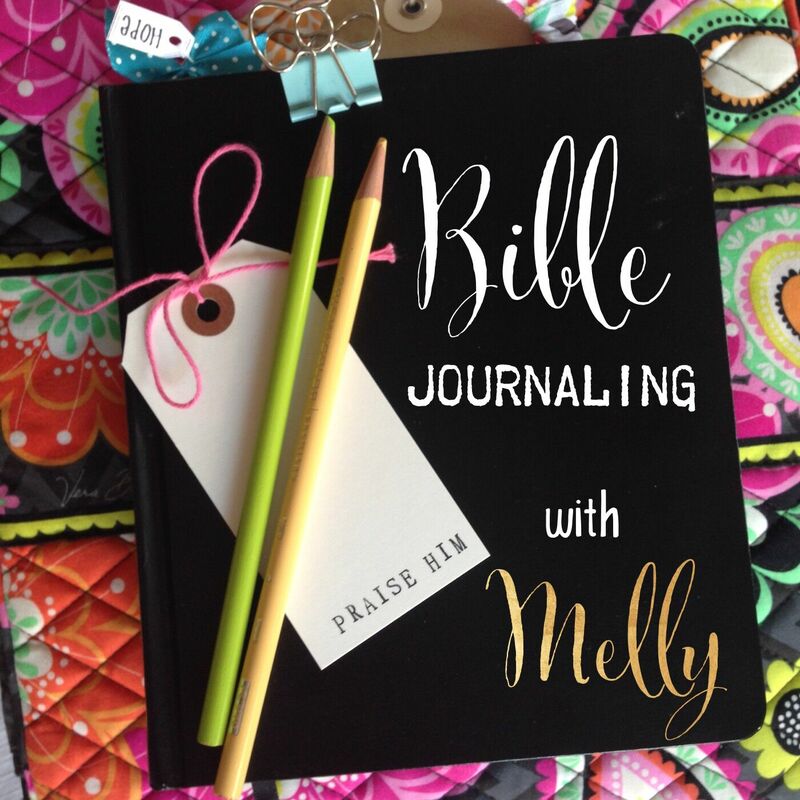 A fun, you-don’t-have-to-be-an-artist way to create a Come All Ye Faithful invitation! You can easily adapt the last idea with other party themes. Just head on over to Party City or the dollar store or shop online at Oriental Trading Company to pick out some trinkets to toss into your goodie bag or box. Ooooo, here’s an idea—have a mystery party. Use brown lunch bags, make a plain party invitation on white paper (have everyone meet at your house so they don’t know the final destination) and throw in some trinkets to give the guests hints of the theme…white socks, little kids’ plastic bowls and a packet of relish…you’re throwing a bowling party and serving hotdogs! The possibilities are endless! Have fun! This party was featured on Tip Junkie! Cute cute cute!!!! I love that you were like this already when you were in the third grade. You are a super fancy party thrower. I am a super lazy party thrower. Can you believe I came up with that bowling party idea just now?! We've gotta do that.